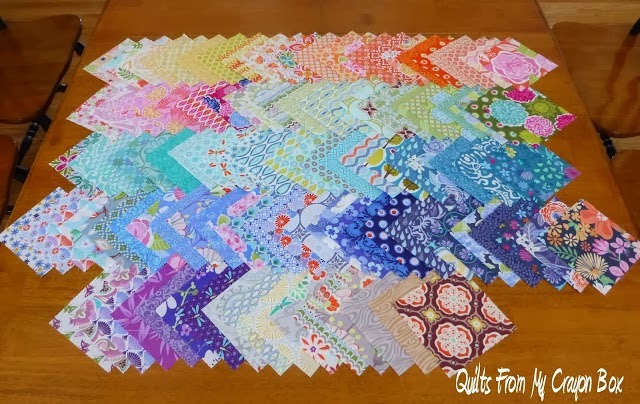 Crayon Box Quilt Studio: Kate Spain Charm Swap Round 2 is now open! Update: There are only 12 11 7 4 spots left! Here it is! What you've all been waiting for. 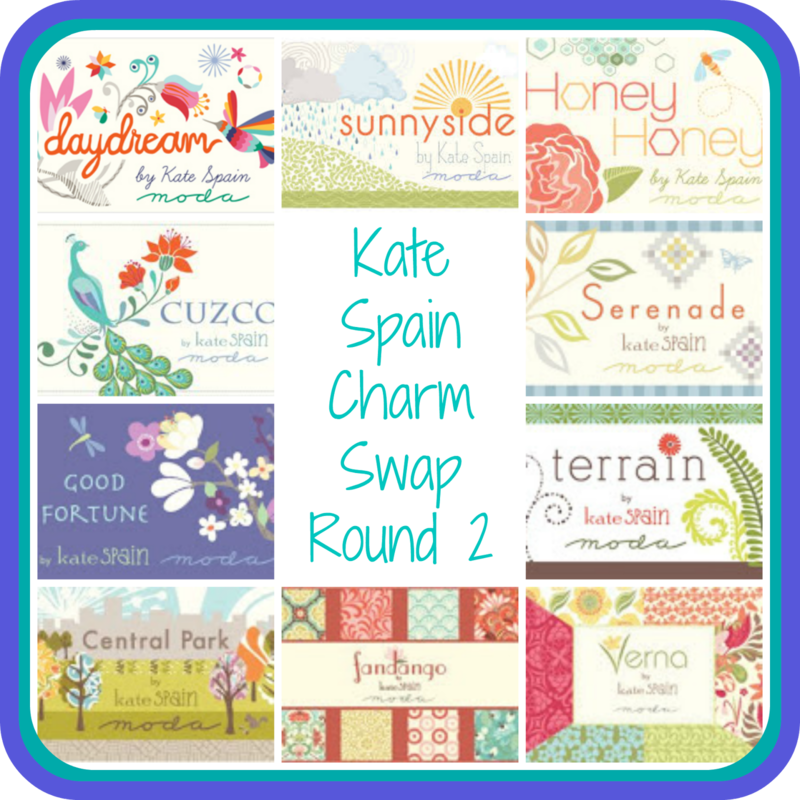 The official opening of sign ups for the Kate Spain Charm Swap Round 2! So many of you have been waiting for this day to come and I know this round will fill up really fast so you don't want to wait to add your name to the list. 1) This swap will be open to 56 participants, me included of course. This is for all of Kate's fabric lines except for the Christmas/Holiday ones. The roll call of included lines is below. 2) Each spot is 2 Kate Spain fabrics, 1 yard of each, and I strongly suggest that you purchase at least 1/4 yard more in case of any cutting mistakes you might experience. Last round someone bought fabric from an online and the shop where she ordered it from cut it short so she had a bit of a scramble. Better safe than sorry. 3) Fabric must be new and unwashed and from a smoke free environment. 4) Cut your yardage into 5 inch squares (56 per yard) total = 112 charms. Press your fabric and remove the selvages before cutting. You can follow the great tutorial on how to cut your charms from yardage by Elizabeth Hartman of Oh, Frannson! found here. 5) Ship them out to me by April 5th. Put them in a Ziploc bag and include your 112 charms, an index card with your name, mailing address and email address (in case your envelope opens up, your charms will stay safe and dry and your contact info will get them back to you. I don't know if this has ever happened in real life but again, better safe than sorry). You must also include a SELF ADDRESSED STAMPED ENVELOPE so that your charms can be mailed back to you. I will not be billing anyone through Paypal. Unfortunately due to the cost and complexity of shipping back internationally, this swap will be for US participants only. ***In addition, please triple check that is the postal person put the stamps on the return envelope for you, that it is at least the same amount of postage that is on the envelope shipping to me. In round 1 two people were short on their return postage and I want to avoid that at all costs this time. Once I receive them all I will sort and return a stack of 112 different charms to each participant! You can sign up for more than one spot but to start I will allow only 2 spots per participant to give more the chance to get in on the fun. (2 spots = 224 charms, 56 each of 4 different fabrics). They will be in the mail to you 2-3 weeks later. Since I'm attending MQX East the following week I won't be able to get them back out until I get home but of course if I receive the charms from all the participants before the show, I'll do my best to mail them beforehand. 6) Very important!!! Please choose fabrics that have not been claimed by another swap member. Please join the Kate Spain Charm Swap Flickr group and check before purchasing fabrics to see what has already been chosen; we want to avoid duplicates. Once you have chosen your fabrics please post pictures, the Fabric line and specific print/color information to the Flickr group. I've also added a list post so that it will be easy to see the names and color ways chosen so far. Once you've chosen your fabrics make sure you add both the photos and the names to the list post. There is a list here of all the fabrics used in Round 1. No duplicates please. And as you can see from the picture of the Round 1 charms, there was a lot of Green, Aqua/Teal and Blue charms so if we could get more this time of the other colors available, that would be awesome. I for one am going to mix up the prints/colors from Round 1 and Round 2 when I make my quilts. 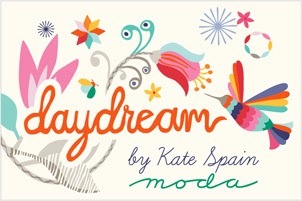 So who wants to join in on Round 2 of the Kate Spain fabric frenzy? When I email you and confirm that you are in the swap, I will include my ship to address. Grab the new blog button and leave a comment so I know who is participating. The code is on my side bar. Feel free to spread the news if you'd like. Here are all the Kate Spain lines that are included in this swap. Remember, no Christmas/Holiday fabrics. Some of her older lines are a bit scarce but various prints can still be found if you do a little hunting. Hurry up! What are you waiting for? Add your name to the list. You don't want to miss out on this one. you know I'm in -- 2 spots please. I got my Verna ready to cut and ship to you. I would love to be included again! I loved the last charm swap! I would like two spots again. 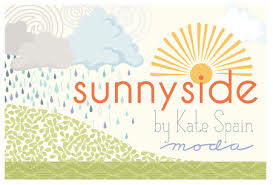 I love Kate's fabrics! I replied to your e-mail, but I am signing up here too, just to be sure! The squares from the last swap are amazing! and just succumbed to the beauty of the fabrics and emailed to ask for another spot. I just done get how to use Flickr. don't know anything about it. can you explain some basics to me? and is there a separate group for charm swap round 1 and Round 2 ? I'm hoping to hop in on this round. My mom and I are both wanting to do this! so, two entries for us! We are using 4 purple fabrics from Cuzco! I would like to participate. I have sent you an email and have posted fabric selections/pictures on Flickr site. I'm in for 2 spots! :) I just love KATE SPAIN!!!! I sent you an email with my info, as well as posted my fabric choices/pictures on Flickr! I can't wait! I would love to do this if there is 2 spots open. I'm not sure about selection on flickr but I'll just send what I have and get 2 in return. You pick! I sent you an email and would like two spots please! I'm sad to have missed out on the first round but I'm so excited for round two!